The Daily Caller blog yesterday contained an inaccurate story regarding a correspondence that was part of the emails hacked from East Anglia University Climate Research Unit (CRU) in November 2009. For the record, while I received the email from CRU as forwarded by Dr. Mann, the forwarded message came without any additional comment from Dr. Mann; there was no request from him to delete emails. At the time of the email in May 2008, I was employed by Alfred University, New York. I became a NOAA employee in August 2008. These claims are simply the latest attempt to try and manufacture scandals and smear scientists, particularly Mike Mann, based on the UEA emails. The story appears likely to have come from Senator Inhofe’s office who presumably had access to the transcripts taken by the NOAA Office of the Inspector General (whose investigation found no evidence of any wrongdoing by NOAA employees). The story was planted with Steve McIntyre, Anthony Watts, and Chris Horner, and then linked to by Inhofe’s office to provide a little plausible denialability – a rather blatant media spin operation. But the facts of the case do not support the narrative they are pushing at all. While Jones’ original email was certainly ill-advised (as we stated immediately it came to light in Nov. 2009). Eugene Wahl was not subject to FOIA at the time (since he was not a federal employee) and was not subject to UK FOI anyway since he was working for a US-based university. Nor was he aware of any ongoing FOI actions in any case. In the original emails released, Mann stated that he would notify Wahl of Jones’ email, and his only involvement was to forward the Jones email to Wahl which Wahl’s account confirms. So what is the actual issue at the heart of this? A single line in the IPCC AR4 report (p466) which correctly stated that “Wahl and Ammann (2006) also show that the impact [of the McIntyre and McKitirck critique] on the amplitude of the final reconstruction [by MBH98] was small (~0.05C)”. This was (and remains) true. During the drafting Keith Briffa corresponded with Eugene Wahl and others to ensure that the final text was accurate (which it was). Claims from McIntyre that this was not allowed under IPCC rules are just bogus – IPCC authors can consult with anyone they like at any time. However, this single line, whose inclusion made no effective difference to the IPCC presentation, nonetheless has driven continuing harassment of everyone involved for no good purpose whatsoever. 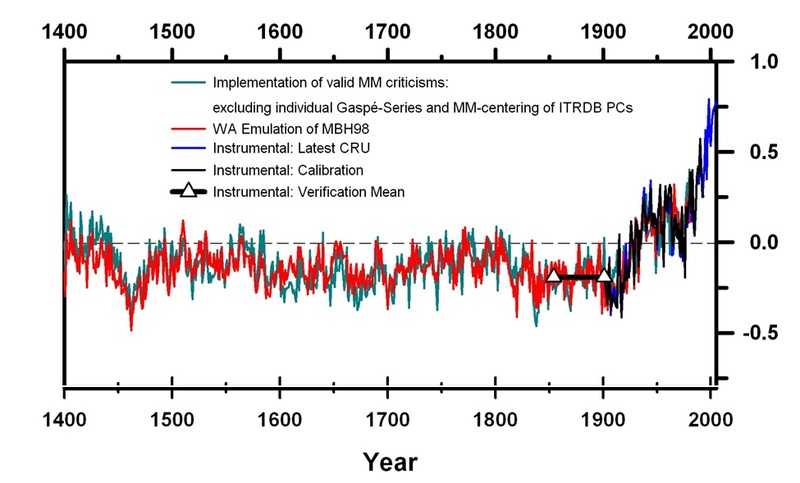 Wahl and Ammann did show that MM05 made no substantial difference to the MBH reconstruction, whether it got said in the IPCC report or not. That this inconvenient fact has driven hundreds of blog posts, dozens of fevered accusations, a basket load of FOI requests, and stoked multiple fires of manufactured outrage is far more a testimony to personal obsession, rather than to its intrinsic importance. The science of paleo-reconstructions has moved well beyond this issue, as has the interest of the general public in such minutiae. We can however expect the usual suspects to continue banging this drum, long after everyone else has gone home. There’s no need for a link. The big fuss over “Hide the decline” just amounts to ridiculous accusations that was based on someone’s scientific choice to remove knowingly bad data from a graph and replace it will knowingly reliable data. The “issue” was well known in the scientific literature. For those unfamiliar with the literature, none of them seemed to give a damn for a decade or so until the accusations started flying. You might not like the scientific choice to work the proxy reconstruction graph in the way it was done, but that was the choice, and the accusations of lying and manipulation as some have done (Curry being the latest the join the crows) is just absurd. There’s no need for ‘references’ to see this. When people say the ‘science has moved beyond this,’ it’s because actual professionals and people who have real things to do with their life care about getting things right and learning more about the wonders of the natural world around us (and in the case of proxies, how it worked in the past), rather than pushing an agenda by character defamation and playing “he said, she said” games. I’m not sure what you are asking us to “link” to. If it is raw data, you can access quite a lot of it from the “Start Here” or “Data Sources” tabs. There are also excellent posts on the whole “climategate” debacle, which place the email correspondence into its proper scientific context that date from the time of the release. You can find those using the “search” tool. If you can be more specific, we’d all be happy to help out. showing how the crafting reconstructed and measured data changed shape of the curve compared to the pure reconstruced data which was clipped off. R. A. Muller has rather strong words for that procedure and keeps the audience wondering how the discrepancy after 1960 for the two datasets could mean anything else than the reconstruction has servere issues over all the time. Re Eric’s response in #38. Lost in Chris Horner’s poor writing, exaggeration, denialism and scientific irrelevance is a bit of a point: forwarding a request to delete emails, albeit without comment, sure sounds like participating indirectly in actions with intent to delete emails. I agree that the concept of indirect participation can be stretched to meaninglessness, but it doesn’t have to be stretched far at all to encompass Mann’s forwarding of an email. In Mann’s shoes, I expect I would’ve done the same thing, so this is no criticism of him, but that particular PSU Finding of no indirect participation appears to be somewhat flawed. The only question I have is: Why did Jones want the AR4 emails suppressed? I don’t see any crime, but I’d like to understand his motivations. I would think CONOR1 might want something better than a blatant distortion, don’t you? I mean, after all, there are dozens of reconstructions now, and they all pretty much agree with MBH ’98…as do borehole reconstructions, etc. I think you sell our visitor’s intelligence short. My belief (conviction) on Jones’ motive is, that he was simply trying to protect the confidentiality of, what Gavin called, ‘pre-decisional deliberations’, as necessary for the candour required to make such deliberations productive. The argument would apply in general, but acquires special urgency in the face of a well-resourced distortion campaign that will use whatever raw material it can lay its sticky fingers on. Evidence for my understanding can be found in several of the stolen emails from around that time, where precisely this issue of confidentiality, almost in these very words, are being discussed. This includes one email sent by Briffa containing a comment by Jones himself (while travelling in Switzerland), which documents the whole group’s strong feelings on this. The report lays most of the blame for the FOI refusals on UEA, rather than CRU or Dr. Jones. Yeah. I read Mullers phizics fer future prez’s (dummiess version) back-to-back with Burton Richters book “Beyond Smoke and Mirrors”. It’s funny. When I first got Muller’s book I thought it was awesome. Then as I read I realized there was an awful lot of misinformation in it. Poke through both of them. Muller says that you can’t make a bomb from reactor grade plutonium which is false. Richter gets it right and says you can. It’s been done. Its documented. Jimmy Carter declassified that fact. I don’t want to psycho-analyze muller but he is sloppy. Anything he says you better double-check via an independent source. Are there any procedures for records retention for all those involved in the IPCC Report 2007 and have there been any changes made records retention for the next Report? #113: some progress. Thank you. These procedures do cover retention of Review comments by the IPCC Secretariat for “at least five years”. The Review itself is to be “open and transparent”. I therefore presume that all the relevant drafts that go with the comments are also retained for the same period, and all the records pertaining to the other stages, all held by the Secretariat. The latest date on the adoption of these procedures is 2008. It is not clear what changes have been made since 2007. However, I wouldn’t see any reason why individuals involved in the IPCC 2007 need to keep any of those records themselves, including emails. Good records management practice would require individually held IPCC records to be deleted. But hey Gavin, as you say nothing is sacrosanct – except your hockey stick! Has someone forgotten to tell you that there is more than one hockey stick? Perhaps I need to point out that it’s difficult for something to be sacrosanct if there are several of them. Litigation in the 1970s established that press releases from a senator’s office are not protected under the “debate clause” of the Constitution. Maybe a few scientists should consider a libel suit. If Inhofe’s claims damage reputations of scientists, and/or affect their funding, there is clear harm to be overcome. It’s a mark of how tolerant of criticism scientists are that none have sued Inhofe already. Maybe its time to put the climate deal on pause and use your big analytical brain to understand tribal behavior and media narratives. You have enough climate data to make your point. Seriously, what would happen if you analyzed the language and metaphors used on popular television shows. Are there any patterns of thought? Are there predictable linguistic cues used? Now the tricky part is communicating it to the rest of America. Your enemy is not McIntyre, its American Idol, Fox and Friends and Bill O’reilly. They’ve succeeded in selling America on deregulation which is arguably a more arcane and abstract idea than even the most complex theories you discuss. C’mon, its time the good guys win this time around. You work too hard, your data holds up. No. Climate scientists should do climate science. We don’t know nearly enough to know how much trouble we’re in. It is up to scientists to develop reliable understanding of their objects of study. It’s up to the citizens whether they want to take advantage of that understanding or ignorantly and blindly drive civilization into a ditch. The Fermi Paradox probably has many answers. This is one of them.